Acceleration from 0 to 60 km/h (37 mph) in under four seconds and from rest to 100 km/h (62 mph) in less than eight seconds is pretty impressive even for a gasoline-powered vehicle but this performance is delivered from an electric vehicle: the BMW i3 just announced by the German luxury car maker. 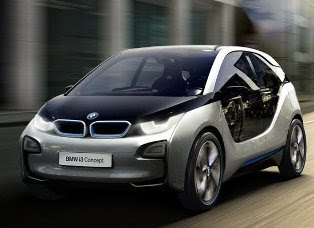 Production of the i3 is scheduled to commence in Leipzig in 2013. In 2014, BMW (Munich) will launch a second EV dubbed the i8. The i3 incorporates numerous design innovations, with many of them realized through the use of plastics and carbon fiber composites. According to BMW, "Innovative use of materials and intelligent lightweight design not only enable the i3 Concept to travel long distances on a single charge and provide superb safety in the event of a collision: they also help give the car its excellent driving dynamics." The so-called Life module of the car conjures up a feeling of space inside the car more generous than even the latest conversion vehicles can offer,claims the OEM. Select materials lend the open and airy cabin a lounge-like character. The use of renewable raw materials is another defining characteristic of the interior, offering passengers a further means of "experiencing" the sustainability of the vehicle. Parts of the instrument panel and door paneling are visibly made from natural fibers. The four-seater opts for wide-opening opposing "coach" doors, boasts a boot capacity of around 200 liters and has an additional functional compartment in the front. Large glass surfaces and black elements like the window surrounds and door sills are said to give the vehicle a feeling of lightness and, together with the exposed carbon structures, draw attention to its low weight. The front end of the BMW i3 Concept, meanwhile, has a very clear and uncluttered design. The dominant element here is the molded kidney grille which has the hallmark BMW i blue background and - thanks to the car's all-electric drive system - is totally blanked off. Below the kidney grille the silver-colored layer lends the sculptural front apron its form. Black surfaces identify the functional areas of the front end, such as the load compartment under the hood and the air inlets. The large, retractable rear window offers optimum access to the luggage compartment, and the roof pillars stand upright to create as much space as possible in the interior. The rear window is also home to the tail lights, which are U-shaped (like the headlights) and appear to be floating in the glass. The wide, silver-colored rear diffuser marks the body's lowest edge and allows the driver to experience the car's efficient aerodynamics. Bordered by a blue layer, the diffuser tapers heavily towards the road and appears to continue underneath the car. The form of the diffuser underlines the car's powerful stance. The electric motor is positioned over the rear axle while in order to ensure the greatest possible electric range, the battery in the BMW i3 Concept is correspondingly large. The most space-efficient location to store the battery cells was in the car's underfloor section, where they occupy the whole of the module's central section, giving the car good weight distribution and a low center of gravity. The battery is penned in by aluminum profiles, which protect it from external impacts. Crash-active structures in front and behind it provide the necessary energy absorption in the event of a front- or rear-end collision. SGL Automotive Carbon Fibers (Moses Lake, WA), a joint venture of BMW and SGL Carbon (Bonn, Germany), will manufacture carbon fiber for use in the i3. The fiber will be processed into lightweight carbon fiber fabrics at the second joint venture site in Wackersdorf, Germany, and then used in carbon fiber reinforced plastic (CFRP) parts and components made at the BMW plant in Landshut, Germany. The Moses Lake carbon fiber plant covers 60 acres of land with the option to purchase additional land to cater to future growth. The plant will initially run two carbon fiber lines, each with an annual capacity of 1,500 metric tons. The first carbon fiber line was due to be commissioned in the third quarter of 2011. To guarantee supply of carbon fiber, Skion GmbH, a company owned by BMW's heiress Susanne Klatten, recently increased its stake in SGL Carbon to 29%. Skion now holds 1% less of SGL's stock that according to German law would require Skion to make an offer for SG and also protects the company from corporate raiders. Volkswagen is also a notable stakeholder in SGL Carbon, at last count holding an 8.18% stake. *It's "Bimmer" and not "Beemer." Check this link to find out why.